Google Home vs Amazon Echo: Which is the best smart speaker? Home IT Google Home vs Amazon Echo: Which is the best smart speaker? QuickBooks Online vs Desktop: Which Is Right For You? We’re not talking about Bluetooth speakers here – we’re talking about speakers that live in your house, permanently plugged in and connected to the internet, which you can command using your voice. In the case of Amazon’s Echo line, you’re speaking to Alexa; in the case of Google’s Home line, you’re speaking to Google Assistant. While we’re looking at the main Echo and Google Home speakers in this article, it’s worth thinking about how you may want to kit your home out for future use. Amazon has the biggest range of smart speakers. The Echo is the all-rounder, which costs £90, down from the original’s £150. If you want a smaller speaker, the tiny Echo Dot costs £50, making it cheap enough to fill your home with. Its sound isn’t great if you want something for music, but you can use Bluetooth or the 3.5mm audio jack to hook it up to a better set of speakers. For smart home enthusiasts, there’s the new Echo Plus (£140), which has a built-in Zigbee hub for controlling devices, such as Philips Hue bulbs. It’s a great idea in theory, but it’s not quite ready for the primetime. Then, there’s the Echo Show, (£200) which adds a touchscreen to the Echo, so you interact with the assistant in a completely different way, and view visual content, such as a security camera’s feed. Amazon has a ridiculously thorough product line when it comes to Echo devices. – The Echo Show, which enables video calling. – The Echo Look, which is intended for fashionistas. – The Echo Spot, which is like a really fancy alarm clock. – The Amazon Tap, powered by Alexa, which is essentially a portable Echo. All of which is to say one thing: Amazon is way ahead of the game when it comes to voice-powered home devices. 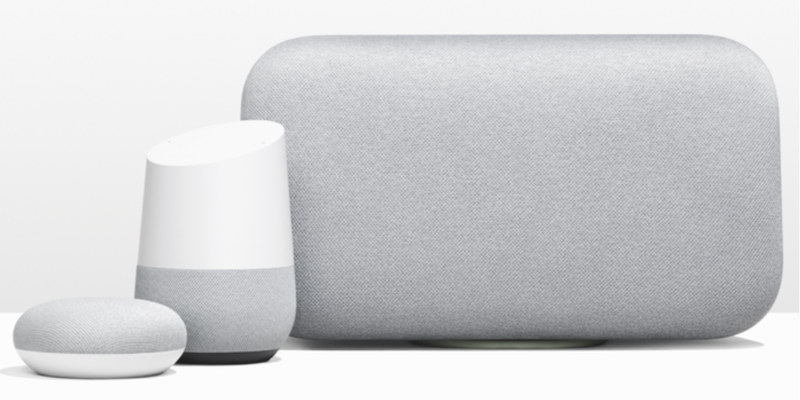 Google’s playing catch-up this week in releasing the Google Home Mini and Google Home Max, and Apple hasn’t even entered the ring yet (its HomePod smart speaker has a loose December 2017 release window). At this point, if you’re thinking about buying a smart speaker, Amazon’s making a far more compelling argument in terms of sheer flexibility and pricing. The Amazon Echo features the Alexa digital assistant, while the Google Home is loaded with the imaginatively named Google Assistant. Alexa is capable of understanding simple commands, or even a series of simple commands, but they’re fairly basic. And the default search engine is Bing. Alexa also requires you to phrase things in a particular way for her to understand you, and the language you have to use is not always natural. Amazon’s other problem is that it’s one wake-up word (Alexa, by default, but you can choose to have Echo, Amazon or Computer) means that the voice assistant often wakes up by mishearing what you’ve said. By contrast, Google Assistant has the distinct advantage of, well, Google. As such, Assistant doesn’t just have a wealth of information – it’s built right into Google’s overall architecture. Tell Google Home your shopping list and Assistant will be able to reproduce that in your Pixel phone later. And, by using a two-word wake-up phrase, Google Home goes off less often by accident. Google Assistant also boasts two-way conversation based on Google’s own natural language processing algorithm. Assistant is context-aware, so conversation should be more natural and less like a stilted list of commands. For example, you can say, “What’s the weather like tomorrow?” to get a forecast. Follow up with, “And tomorrow”, and Google knows that you’re after a follow-up weather report. The power of Google means that you can ask for directions or traffic reports to anywhere, with the results being pulled from Google Maps. In comparison, the Echo can only give you traffic information to one address that you enter into the Alexa app. That’s not to say that Google wins everything hands-down, as Alexa can do some things that Google can’t. For example, Alexa can pull information from a G Suite Google Calendar (that’s a paid-for account), whereas the Google Assistant still can’t. And, when Alexa can’t do something, there’s an app store full of Skills that let you expand capabilities far beyond what Google Home can do. There’s everything from tube status updates to bedtime stories in the mix. Both devices now support multiple users, using voice recognition so that you can get tailored calendar and route information.